Bayesian confidence intervals for the mean, var, and std. Input data, if multi-dimensional it is flattened to 1-D by bayes_mvs. Requires 2 or more data points. 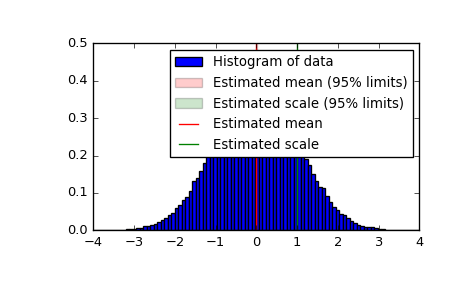 Probability that the returned confidence interval contains the true parameter. with center the mean of the conditional pdf of the value given the data, and (lower, upper) a confidence interval, centered on the median, containing the estimate to a probability alpha. Each tuple of mean, variance, and standard deviation estimates represent the (center, (lower, upper)) with center the mean of the conditional pdf of the value given the data and (lower, upper) is a confidence interval centered on the median, containing the estimate to a probability alpha. Converts data to 1-D and assumes all data has the same mean and variance. Uses Jeffrey’s prior for variance and std.